Bulgaria is still undiscovered golf destination but highly appreciated by the golfers that visited it. Signature golf courses, green mountains, delicious food, fine wines and millinery history – the combination that guarantees perfect holiday. You will immerse yourself in the tranquility of the largest monastery in Bulgaria, hidden in the recesses of the highest part of the Balkan Peninsula - Rila. Will enjoy the beauty of its architecture etched in the green lanes of the mountain. You will love Bansko’s streets, a typical small Bulgarian town that has preserved the old traditions of architecture and cuisine. You can taste wines from the south Bulgaria in the smallest city in the country - Melnik. It is famous for its wines than with its beautiful houses from the 18th century. We will walk Pirin - the second highest mountain in Bulgaria, but the first in beauty. You will enjoy playing a challenging course of 27 holes, Ian Woosman signature golf course. Golf Academy will help you introduce and learn the golf game or improve your swing. Sofia Place 3 stars. The hotel is located in the center of town, 2 minutes from the pedestrian zone and shopping center. It was built 3 years ago and is very comfortable and cozy. Pirin Golf Apart Hotel is located amidst a golf course, surrounded by greenery and two of the highest mountains in Bulgaria - Rila and Pirin. Your studio has a bedroom, sitting room with TV LCD with more than 40 programs, DVD player, balcony with outdoor furniture, small kitchen equipped with 2 ceramic hobs, fridge, oven, toaster and kettle for hot water, washing machine. The bathroom has a shower. There is hair dryer. Your apartment can be 1 or two bedrooms, balcony, bathroom, living room TV LCD with more than 40 programs, DVD player, kitchenette equipped with 2 ceramic hobs, fridge, oven, toaster and kettle for hot water, washing machine. Dinner and breakfast are hold in the Club house. The large windows and terraces overlooking the golf course and Pirin Mountain. Food is tasty and plentiful. Day 1 (Sunday) Arrival at the airport of Sofia, where you will be welcomed by English-speaking giude. Convenient bus will take you first to Sofia city center. The program begins with a walking tour of the city. You will see St. Sofia church dating from the V - VI century, which gave the present name of the city. Next to it is the Alexander Nevsky Cathedral with its gilded dome. The following places of the tour are St. George Rotunda (III-IV century) and urban fortresses. All are monuments of a 5000 year history. At the end of the afternoon will depart to the Pirin Mountains, located in the southwestern part of the country. After 3 hours time you will be greeted with a welcome cup in Pirin Golf & Coutry Club and will be able to accommodate. Then it will be your first dinner at the Club House. A game of 18 holes. You will be able to familiarize yourself with this course of 27 holes with the signature of Ian Woosman. In Golf Academy equipped with Scope, S & M Putt Lab, you can improve your swing or take golf lessons first. Driving range is comfortable and pacious. Practice area is spacious. The complex has several "neighborhoods": Downtown, The Lake and Pirin I, II and III, and several restaurants - Club House, East Europe and Half Way House. Afternoon optional visit to Bansko (cost € 5 for a minimum of 6 pax). You will find a charming city, which boasts with its architecture. Bansko has preserved the Bulgarian literature throughout the 5th century of Ottoman rule and faith. Here is preserved church of 16-17 century. The"new" church is also interesting, completed in 1835. Its walls are 1.10 m thick and covered with a wall paintings. Tranquility of her garden wall is provided by four meters in height. 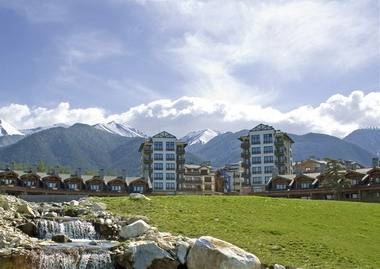 Bansko has 112 houses, which have been declared architectural monuments. They date from the mid 18th century to mid 19th century. These houses are built to withstand siege - with thick stone walls on the first floor with thick and reinforced doors and a secret room. Dinner at the Pirin Golf complex. Day 3 (Tuesday) - buffet breakfast hold in the Club House after that playing 18 holes. ½ day excursion to the Natural Park Belitsa with its dancing bears. They are collected at the initiative of Brigitte Bardot, bears, which were exploited in street performances. They are returned into their natural environment - the mountains. Lunch on the spot. Price 20 euros for the trip at a minimum of 6 pax. Return and dinner. Day 4 (Wednesday) - buffet breakfast in the Club House. Day trip to Melnik and Rozhen Monastery (optional, price € 45 minimum 6 pax) with tasting of local wines and lunch spot or a game of golf 18 holes (30 euros). Melnik is the smallest Bulgarian town with about 500 inhabitants. Situated at the foot of Pirin. Its beautiful houses built 11 to the 17th century, surrounded by high white cliffs. This is a museum town and is known for its red wines, which can be tasted on the spot. Melnik Pyramids - a beautiful natural phenomenon, which is worth seeing. A few kilometers away is the Rozhen Monastery. Founded in the 9th century. Its history is long and exciting. It was built as a fortress of high walls surround. In his yard is planted a vineyard. Can be visited monastic rooms (cells) and the church. Its altar is a real work of art. Day 5 (Thursday) - buffet breakfast in the Club House. Play 18 holes of golf or a day trip to the National Park area with 40,322 ha, which is included in the UNESCO list of natural wealth. There is the oldest tree in Bulgaria - a pine aged 1300 years. It has seen the creation of the Bulgarian state - one of the oldest European countries. Its trunk has a diameter of eight meters. Its height is 22 meters. Picnic spot with a picnic basket. Price 43 euros for a minimum of 6 pax. Day 6 (Friday) - buffet breakfast in the Club House. Separation of Pirin Golf and departure to the Rila Monastery, the largest monastery in Bulgaria. It was founded in the 10th century. It was declared a monument of world culture and is included in the UNESCO list. Visit the monastery. Lunch at the trout hatchery. Departure to Sofia. Arrival at 16 o’clock. Accommodation at hotel Sofia Place in the city center. Free time. Dinner in 20 o’clock in folklore restaurant. Gift a bottle of good local wine. Day 7 (Saturday) - Breakfast (or dry pack if the flight is very early in the morning). Free time and airport shuttle. Please, contact us for price offer.